What comes to your mind when you think of Israeli cuisine? Hummus and Baba Ganoush? Falafel and Shakshuka? 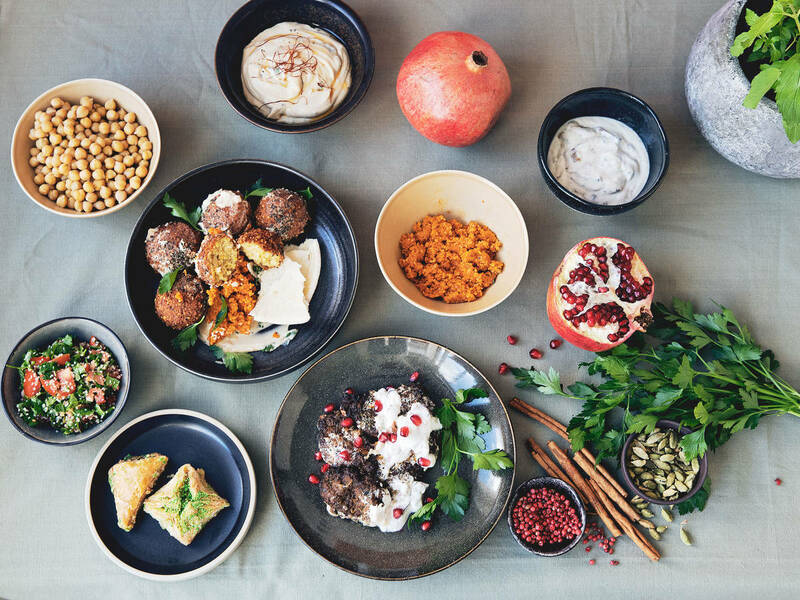 In recent years, the vibrant food from this particular part of the world has been experiencing quite a moment, whether on our screens, in our cookbooks, or with the booming Israeli restaurant trade in many major cities. What makes these dishes such a hit , what does it mean to eat "kosher", and where do all these popular recipes come from? Come with us on a whirlwind culinary trip to Tel Aviv and learn more about the cuisine, plus 10 delicious Israeli recipes to try now at home! If you've been lucky enough to stroll through one of Tel Aviv's typical markets, you'll probably remember the huge variety of fresh ingredients, spectacularly colorful and intensely fragrant—an experience of sensory overload. It's a melting pot of flavors and traditions, which brings us to the first and point: There is no one true, definitive Israeli cuisine. Israel's cuisine is influenced by various cultures and traditions and is so varied—and delicious—because of its history. As you may know, Israel is an immigrant country. More than 60 nationalities live here together, bringing their very own recipes and ingredients, and thus ensuring a lively culinary exchange: various Mediterranean, Moroccan, Lebanese, Iraqi, Arabic, and Palestinian elements find their place in Israeli dishes. Jewish and kosher cuisine has also made a considerable mark on the culinary history of Israel. What makes food kosher or not? Though we’ve all heard the word "kosher" before, very few people know what lies behind it and what distinguishes kosher foods. The purity law of Judaism plays a particularly important role here. Here is a quick primer of what it means. Pork is not considered kosher, while poultry such as chicken and turkey are permitted. Sea animals may only be eaten if they have fins and scales, such as tuna. Lamb and beef are considered pure and are therefore fit for human consumption if the animal has been slaughtered by a specialist, i.e. ritually slaughtered without prior stunning. In addition, traditional kosher recipes strictly separate meat from dairy products. "Neutral foods" such as vegetables, fruit, eggs, and grains may be eaten without exception. The most popular Israeli recipes owe something to Israel's excellent weather—optimal temperatures and light radiation bring out fresh, sun-ripened ingredients such as tomatoes, eggplants, avocados, dates, and pomegranates throughout the year. You’ll eat legumes in all shapes and colors—not to forget the famous chickpea, which forms the basis of many Israeli dishes such as hummus and falafel. Rice, bulgur, and couscous are also frequently served. Another ubiquitous ingredient is tahini or tahina, a velvety paste made from finely ground sesame seeds, the origin of which is often attributed to Arab cuisine. Sesame paste is a basic ingredient for hummus and various other dips and sauces. Another reason why this diverse, somewhat hard-to-define cuisine is so refreshing and exciting is the range of herbs and spices used. Typical spices are cardamom, cumin, paprika in all degrees of spiciness, cinnamon, and anise seeds along with fresh herbs are indispensable. A true classic of Israeli cuisine is this so-called "hummus soup". Tom Franz, cookbook author and one of Israel's most famous chefs, provided us with the recipe for the creamy soup made from chickpeas and spinach. According to Tom, the pairing of chickpeas and spinach has a long tradition in the Mediterranean. "Shakshuka" is one of Israel’s national dishes is a hearty breakfast recipe that also works just as well for brunch or dinner. Aromatic, sun-ripened tomatoes, sweet and hot bell peppers, onions, garlic, olive oil, and eggs are cooked together in a large, hot cast iron pan, and topped with fresh herbs. Modern variations like the "Green Shakshuka" use green peppers, spinach, and feta. Another delicious recipe by Tom Franz are these kebabs skewered onto fragrant cinnamon sticks and served with green tahini. The cinnamon stick releases its deliciously fine aroma to the juicy kebab meat. This festive dish is then rounded off by the homemade tahini sauce, the so-called "mayonnaise of the Middle East". Eggplant and pomegranate—a true symphony of tastes! This combination of savory eggplant and sweet and sour pomegranate seeds, and aromatic couscous is a beautifully balanced dish to master at home. Falafel—that's what we call crispy goodness! This Arab delicacy is served everywhere and at all times of day in Israel. The small, fried chickpea balls are served in a sandwich made of pita or flat bread along with salad, hummus, and tahini or pomegranate sauce, but you can also enjoy them from on a plate together with fresh vegetables and various dips. If you haven't tried falafel before, what are you waiting for? This smoky and slightly nutty dip made of roasted eggplants and tahini originally comes from the Arab world but is now an integral part of every Israeli cookbook. The creamy eggplant paste makes a wonderful starter with warm flat bread or for dipping fresh vegetables. After all the falafel and hummus, here comes dessert! There are also some sweet classics in Israeli cuisine that should not be missed like the beloved baklava. Star chef Tom Franz shared with us his personal favorite: Nutella and pistachio baklava! "The crispy filo pastry matches perfectly with the nuts and Nutella—just heavenly" says Tom Franz. It’s the most widespread and most popular dish in Israeli cuisine: Hummus! The creamy chickpea dip is served as a mezze in Syria, Lebanon, and Israel almost everyday. Since hummus enjoys such an extraordinary popularity, the creamy paste also often ends up on the plate as a main course. These juicy, tender biscuits not only score highly with their extra soft texture, but also with a great sesame note, which they owe to the famous tahini. Orange zest adds the finishing touch to this delicate pastry. We were able to watch the star chef Tom Franz at work as he prepared this delicious grilled vegetable salad. Known as "Mashveij", it’s a refreshing Tunisian-Jewish dish. It couldn't be easier to prepare: The vegetables are grilled, then peeled, minced, and seasoned. The slightly sweet, roasted dish goes well with sandwiches, seared chicken, or fish. What do you love most about Israeli cuisine and what the dish you can´t live without? Tell us in the comments or send us your favorite recipe to community@kitchenstories.com.